On Sunday, December 22nd, 2013, our former Pastor posed the question, "Are we so consumed and absorbed by being a 'Christian' that we are unfazed and blind to seeing Christ in the everyday?" That was a timely message for me because you see, I was thinking of how I could make 2014 stand out as a year of purposeful living. I felt I needed to take action in some way. The result was an attempt at 365 thank yous. I tried to make it a point to write a small note of gratitude to someone every day for the whole year. My first one was to my 5 year old niece. I did not duplicate any recipients and these did not replace my regular thank you notes, but supplemented them. Having to focus and find something to be thankful for and actually having to address that thanks to a person was challenging at times but very meaningful. "In 2014 I am embarking on a journey of gratitude. Each day I will be writing a thank you note as a token of my appreciation and a personal reminder to be grateful in all things. You are what I am thankful for today. 1 Thessalonians 5:18 '...in everything give thanks: for this is the will of God in Christ Jesus concerning you.'" What I learned from the exercise was to be grateful for the tiniest of kindnesses and to really think about life from the flip side. I sent notes to family, friends, public servants, grocery store personnel, Diva's school staff, Engineer's work colleagues, church members, fellow bloggers, restaurants, and so many other people and places. Some recipients I have met in person and others I haven't. I heard back via letter, text, phone call, e-mail, and even face-to-face from many recipients and didn't from others. I was okay with not hearing from anyone at all because this exercise was not about praise, it was about thanksgiving. Several people inquired periodically about how the project was going and others actually said they were inspired to do write random thank you notes as a result of receiving one. My truest hope is that everyone that received a little note was blessed. At the very least, they knew that someone thought about them that day. One very jarring lesson was the fragility of life and the importance of timeliness. I wrote a thank you note but didn't get it in the mail for a couple of days. 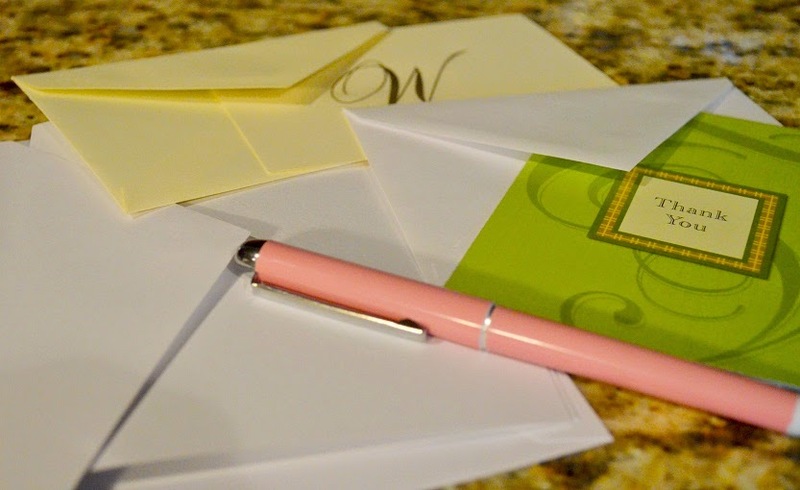 By the time the letter reached the sweet lady's nursing home mailbox, she was in the hospital being treated for a fall - a fall from which she did not recover. Her thank you note was returned to me without ever being seen by its intended recipient. This year of thankfulness was very appropriate. We needed to move closer to Engineer's workplace and it was hard to be thankful when I didn't want to move. But since I had already committed to a year of gratitude, I had to work through my feelings and find thankfulness in the everyday. I truly believe that is what got me through the last few months in The Little Pink House and the first few months at Beloved Bayou when the general mood was so sad. I read the book Choosing Gratitude and its accompanying Bible study by Nancy Leigh DeMoss as well which bolstered my efforts in the beginning. If you are up for the challenge in the new year, consider writing a little thank you note to someone every day. It just might change your (or someone else's) life. *In full disclosure, I did not reach my goal of 365. I was 96 short which means I sent out 269 thank you notes during the year. I will continue on sending notes in 2015 until I reach my 365 as that's what I set out to do.